The LG G2 and HTC One are both running on Android Jelly Bean 4.2.2, and should be getting the 4.3 treatment soon enough. 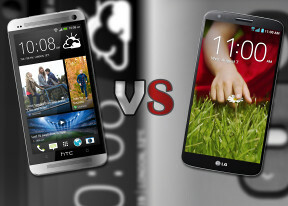 LG and HTC have different approaches to what they think Android should look like and how it should behave. While LG went for a TouchWiz-like approach, filling the software with a gigantic set of features you need constant pop up tutorials, HTC chose a different direction and tried to bring as much multimedia as close to the front as possible. Here are two user interface videos, we've made, to help you get an idea of what Android feels like on the two devices. LG put the Lock/Unlock hardware key at the back of the G2, but even if you aren't too thrilled about it you aren't forced to use it. You can wake the phone with a double tap on its screen and then lock it back with another double tap on an empty space on your homescreen or the notification area curtain. The cool LG lockscreen that lets you peek beneath the lockscreen is onboard. There are five animations for the peek hole type - the familiar dewdrop, ripple, while hole, crystal and the default particle. All of them are really cool and we honestly had a hard time deciding on which effect we like best. The lockscreen now has multiple panes, each containing one widget. The page to the right is special and fires up the camera, but you can easily disable it from the widget menu. The lockscreen on the HTC One isn't as rich as that on the LG G2 in either looks or functionality. There's a clock, weather info and four shortcut slots. You can put a folder instead of an app shortcut if you need more than four apps accessible right from the lockscreen. Missed calls and incoming messages are duly displayed, of course. There's no way to change lockscreen shortcuts independently from the ones docked on the homescreen. Many users may find that inconvenient and it's worth pointing out that the G2 does offer that feature. On the LG G2 you get three homescreen panes to fill up with widgets and shortcuts, but you are free to add more (up to seven) or delete any that you don't need to speed up navigation. You can also set any of the homescreens as default. The front touch buttons are also highly customizable - you can choose their arrangement, you can even add a fourth permanent shortcut for the Quick Memo. You also set black or white background for those keys and choose if that background will be transparent on the homescreen. The HTC One has quite the different homescreen, however. The leftmost pane is called BlinkFeed and looks quite a bit like Flipboard. It aggregates posts from your social networks and stories from over a thousand news sources. You can pick what topics you're interested in and BlinkFeed will automatically pull relevant content. You can also search for specific content. You're not stuck with BlinkFeed if you don't like it - the rest of the homescreen panes are the standard type with shortcuts and widgets and you can set one of them to the be default one (the one you get to when you tap Home). You can't remove the BlinkFeed panel altogether, though. The Notification area on LG's Optimus UI tries to squeeze as many shortcuts as it can. The topmost tab has shortcuts to various radios and features. You are free to add and remove toggles from the edit menu. You can add an insane amount of shortcuts here, and don't have to worry about whether they'll fit on the screen - the row becomes side-scrollable so you can still access them all. Below the toggles are the Q Slide shortcuts - they launch pop-up widget-like versions of the video player, web browser, phone, messages, calendar, email, memo, voice recorder, file manager and calculator. In case you don't need some of those shortcuts, you can remove it via the edit key at the end of the shortcut row. Finally, there's also screen brightness and volume toggles - it's really as functional as it gets here. HTC's notification area has its roots in stock Android 4.2.2. Upon swiping down you get nothing more than a black canvas the date and time and all of your notifications - email, texts, etc. There's a shortcut in the top right, which takes you to the Quick Settings menu. The QS menu shows your contact photo and shortcuts for brightness, settings, Wi-Fi, mobile data, etc. You cannot edit these shortcuts and add new ones, sadly. You can directly access the Quick Settings menu on the HTC One by performing a swipe down with two fingers. On the LG G2 the app drawer lists all your available apps and widgets, with a dedicated tab for user downloads. There is a button in the top right corner, which triggers edit mode and lets you to easily reshuffle or uninstall applications. You can opt to make the icons in the app drawer bigger, too. If you select an app whilst in edit mode, a pop up will let you see information like storage usage. HTC decided upon a different app drawer with Sense 5. Instead of the usual horizontal side-swippable panes of apps you get a vertical grid of either 3x3 or 4x4 apps. At the top there's a large digital clock and weather information. The tedious thing about Sense 5's app drawer is that you cannot drag apps from it to the homescreen. You need to drag an app upward and choose shortcut, which will then send it to the homescreen. Overall two very different approaches. While LG decided to take the Android base and augment it with its numerous Optimus UI features, HTC decided to change the basics and add its own app drawer and a new homescreen pane, which is more app than homescreen. There's also not too much room for personalization with HTC Sense 5, while LG's implementation is much more flexible. Winner: LG G2. While HTC Sense 5 is very smooth and relies on cool animations and flat fonts and icons, LG G2's Optimus UI follows Android guidelines more closely and gives users more in terms of functionality. The lockscreen and notification area are particularly clear wins for the G2.